Whole: The food is complete, as found in nature; all edible parts intact. No fragmented (refined or processed) food because the major nutrients have been removed. For example, choose whole brown rice because both insoluble and soluble fibers are available. Note: tofu is considered a fragmented food because it is made from coagulating soy milk, which in turn is obtained by cooking soybeans and discarding the pulp. Some fragmented foods are considered healthy: wheat germ, bran, black strap molasses and extracted juices. Fresh: Fresh foods should be first preference, if not dried or pickled. Canned, frozen or chemically preserved foods undermine our energy because their nutrient content is greatly diminished. Local: Local food is food that is sourced within 100 miles of your current environmental location. Locally produced foodstuffs are usually fresher, more flavorful and also more economical. Choose local food whenever possible. Seasonal: Seasonal food refers to the times of the year when a given type of food is at its peak, either in terms of harvest or its flavor. Choose seasonal foods whenever possible, or at least from a similar climate. For example, eating tropical fruits during the cool winter prepared the body for hot weather (has a cooling effect), while warming foods are needed to cope with the harsh cool weather. In harmony with ancestral traditions: For the majority of your food decisions, it is a good idea to use food, cooking styles and seasonings that your great-grandmothers used. Hence the majority of our daily choices for wholegrain and legume combinations should be of the continent where your ancestors originated: rice, soybeans, aduki beans from the Orient; wheat, barley, rice, split peas, kidney beans from northern Europe; oats, barley, lentils from the British Isles; wheat (including bulgur and couscous), chickpeas and lentils from Mediterranean countries; farro, kasha (buckwheat) spelt and white beans from eastern Europe and Russia; fonio, kamut, millet, sourghum, teff, chick pea, cow pea (black-eye peas), and hyacinth beans from the African continent; and amaranth, corn, chia, quinoa and scarlet runner beans, lima and peanuts from the Americas. Balanced: A balanced diet includes consuming the right amounts of food to provide adequate nutrition and energy to maintain the body cells, tissues and organs. The idea of balance includes; color, flavor, nutrient complementary, texture and shape. Color: Be sure to include something from the color spectrum in your meals. For example, a variety including something green, red, purple, yellow, white and/ or brown in a meal. Foods of the color spectrum provide different phytochemicals, antioxidants and minerals. Overall, food should be appealing to the eye. Flavor: A satisfying meal should be tasty by offering some of five flavors, sour, spicy, salty, bitter and sweet. Two flavors can be combined in one dish. Nutrient complementary: Choose a grain-and-bean combination for complete protein and complex-carbohydrate complementary. For acid/alkaline balance, your daily diet should consist of about 40 to 50 percent vegetables and fruit, 35 to 40 percent whole grain, and 15 to 20 proteins (beans, legumes, nuts and seeds) by volume. For a full complement of vitamins and minerals, include vegetables, that grow up (green leafy vegetables, such as lettuce, kale, and parsley), down (root vegetables, such as carrots, onions, and parsnips), straight (celery and broccoli), and even sideways (squashes, cabbages, tubers). Texture and shape: Try to include a crunchy food along with the softer ones in meal (nut, cooked and raw vegetables). Real Foods: Try to consume foods that are made by mother nature, not in a chemistry lab. Foods that nature provides are plants, roots, fruits, seeds and etc. “Fake” foods are foods that human beings create, often trying to imitate natural occurring foods, which have been found to cause disease within the body. Note that soy yogurt, cheese and bacon can be considered fake foods, hence unhealthy. Avoid synthetic ingredients, they are ingredients you have never heard of or can’t pronounce, as well as artificial colors or flavors. Fake foods are known to have high intensity on the pallet; that signals “wow” factors to the brain causing addiction over time. Some of the worst ingredients to be aware of are monosodium glutamate (“MSG” – flavor enhancer), sodium benzoate and potassium benzoate (preservatives), butylated hydroxyanisole (“BHA” – preservative), blue, green, red and yellow dyes (food colorings), artificial sweeteners: aspartame (NutraSweet, Equal), saccharin (Sweet’N Low, and SugarTwin), and sucralose (Splenda) , high fructose corn syrup (“HFCS” cheaply produced sweetener), and shortening, margarine and vegetable oils like soy, corn and canola (highly processed, partially hydrogenated = trans fatty acids) as well as any ‘white’ processed food (sugar and flour). Unprocessed: Unprocessed foods exclude high temperatures, high pressure and unnecessary toxic chemicals. Foods that are processed with high heat and pressure lose their nutrients. Examples of these are breakfast cereals, juices and pasteurized foods. Non-irradiated: Irradiated foods are those that have been penetrated with electron beams with an inch and half of the food. Gama rays are used as well, for thicker foods and require nuclear material. This process causes hazards and pollution that is dangerous to our health as well as the planet’s. Foods are irradiated because of the fear of bacterial or virus outbreaks (food safety). This process is a false hope of safety, it causes free-radicals, damages vitamins, and destroys the plants natural occurring enzymes in food, making the food harder to digest. Most commercially produced meats, wheat, nuts, and spices are irradiated unless certified organic or marked raw on labeling (gently heated at a low temperature generally under 115°F). Free from genetic modification (GMO): A genetically modified organism is an organism whose genetic material (DNA) has been altered using genetic engineering technique to create patterns for new genes to last in any condition, adaptive to pesticides, greater crop yield and larger or smaller species. 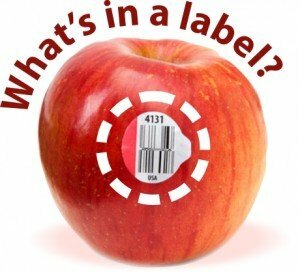 Click on the adjacent apple to find out how some products are labeled.